Take time to pull away from outside influences and connect with your inner self. Devotion to your ideals and concentration on your creative yearnings may even spur you in a different direction. If you’re bored with your health routine because it’s become too predictable, try something different. Consider joining a company sports team, community recreation activities, or an innovative fitness class. Balance activity with ample rest and relaxation. Although you may feel rather romantic from May 1 to 9, you may still need some time to yourself from May 10 to 23 just to sort through a few things. Your hesitation may center on the feeling that you’re moving in a different direction. Realign your priorities during the Moon on May 15. Then, near the Moon on May 30, take inventory of your commitments. It’s time to define where you stand. Meetings, conferences, and presentations fare best from May 1 to 8, and then you’re ready for a little behind-the-scenes action until May 21, when you’re in a great position to launch an important project. Reorganizing finances after May 9 can prepare you for large-scale investments. It’s easy to underestimate and overspend after May 22, so keep your budget in mind before you sign on the dotted line! Finish projects or follow through on agreements already in motion through May 10. 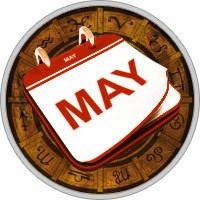 Then, be ready to set forth in new directions after the Sun’s ingress into Gemini on May 21.